With that spirit firmly rooted in his mind, Kutovoy returned to his native Ukraine to make a difference there, using his passion for agriculture and his country. The 1999 graduate (BBA in Finance) is manager of the Ukrainian office of John Deere, an American manufacturer of farm machinery. Kutovoy, 37, also consults for the government, is on the board of directors of Ukraine’s largest agricultural university and helps support an orphanage for mentally challenged children. Not many people outside Ukraine know that it is making drastic reforms despite the threat of war with Russia. Kutovoy said the country is on track for one of the top farm yields in its history, and in Kiev an almost entirely new police force —with new uniforms, cars and higher salaries — recently was sworn in, sweeping away all but a fraction of a unit beset by corruption. “There’s a lot of optimism,” he said. 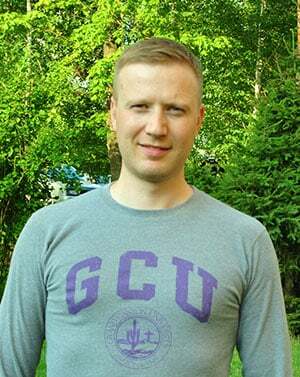 Kutovoy came to Phoenix as a foreign-exchange high school student and soon decided to attend college in the U.S., too. When GCU offered a scholarship, he signed on as a Lope. His enthusiasm for the University was reflected in his involvement in student government and willingness to work various campus jobs. And as with many alumni, Kutovoy was stunned by what he saw during a visit last Christmas.